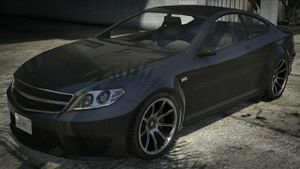 A Schwartzer in Grand Theft Auto V.
The Benefactor Schwartzer is a sports coupe which is essentially a 2 door variant of the Schafter in Grand Theft Auto V.
This car features very aggressive formations which appear to have been inspired by German design styling featured on the C216 Mercedes-Benz CL63 AMG for the headlights and grille; the Mercedes-Benz C63 AMG coupé for the greenhouse area, front and rear bumper area. It becomes very obvious that this is the coupe version of the Schafter. The rear lights resemble those of a W212 Mercedes E-Class. This car also sports a similar look to the TMG Lexus LS (designed in germany by Toyota's racing group). At the base of the front bumper sporting influence is very prevalent. The front bumper features a main central vent whose base appears to have a CFRP insert. Either side of this vent there are two, less tall vents, whose inner edges are parallel to the outer edges of the central vent. Above the central vent there is a large main grille with chrome edges and a horizontal chrome strip splitting it into two halves. The headlamp units have curved lower edges which almost continue the curvature of the bottom edge of the grille. The bonnet/hood has a main elevated area, whose edges run from a top corner of the main grille to their corresponding windscreen corner. The car features rear view mirrors whose outer shells are finished in CFRP. Can be bought for $80,000 from Southernsanandreassuperautos.com. Occasionally parked around Downtown Los Santos before it turns dark. Parked outside of the La Spada restaurant on Aguja Street and Goma Street in La Puerta. The car's name is a wordplay using the adjective for black in German (Schwarz), being a clear reference to Mercedes-Benz and their Black Series models, more specifically the 2012 C63 AMG Coupé Black Series. In Grand Theft Auto Online the Schwartzer sells for $8,000 at Los Santos Customs. When seen from a distance, the Schwartzer seems to have the Schafter's front bumper and grille. Either this is a glitch, a ripped copy of the LOD model, or in the beta, the Schwartzer originally had the Schafter's front design. The Schafter's grille can be put back on in Los Santos Customs, by using the grille option "Big Badge". This option is also available on other Benefactor models, especially the Serrano. The vehicle shares its engine sound with the Stretch, Super Diamond and Elegy RH8. The default radio stations of the car are Space 103.2 and Lowdown FM. This page was last modified on 11 January 2015, at 01:29.